"Honey, why don't you ever make something for me?" 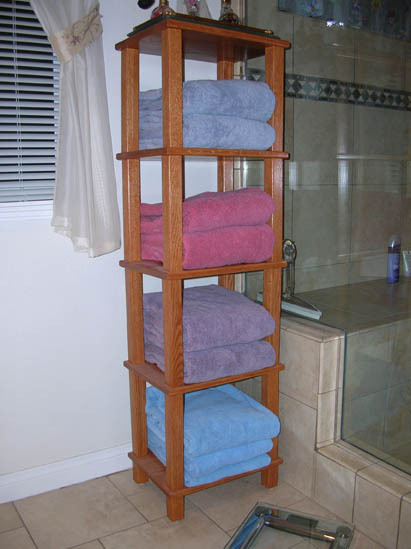 This wood towel stand will answer the call for something practical, interesting looking, and simple to build. We used oak for ours. It's finished with a red stain and urethane. Our local home center has oak boards at 12 inch widths as well as some oak 2x2 material we used for the support posts. Dimensions were determined by stacking a couple of folded towels and measuring. 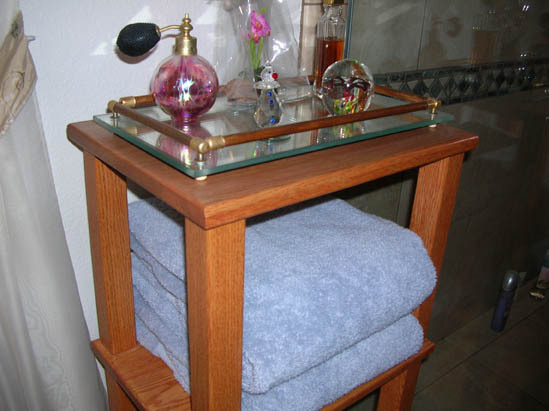 For this wood towel stand, we have each flat board at 11 x 14 inches. The support posts are 14 inches, with the feet at 3 inches. We sanded all edges round, but could have used a router. Connections are done with a simple hole drilled through at each corner then pinned with a dowel. Holding the posts while drilling their center hole is a little tricky. We struggled with ours and made it a lot harder than we needed to. We should have just eyed it up and let 'er fly. Use a drill press is you have one for the flat boards. 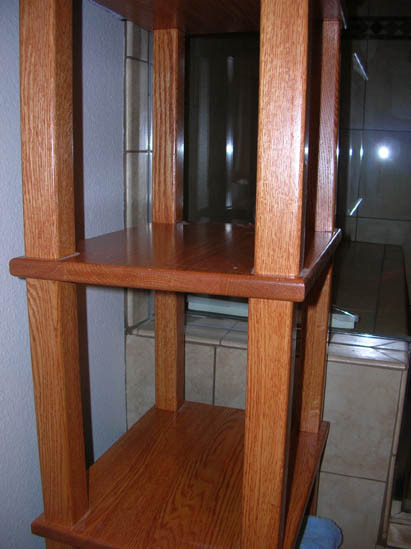 A little glue is all it takes to hold this wood towel stand together. Be sure to sand and finish the surfaces before putting it together. All those edges would be a bear to get smooth otherwise. Don't get any finish on the gluing areas. We used basic rubber pads as feet. The top is flat and makes a neat landing place for those frilly things wives like to have out. Be sure not to drill your dowel hole through the top! Our finished wood is just over five feet tall and has the obvious footprint of 11 x 14 inches. We weren't too sure about this when we started, but the finished piece is pretty cool and shouldn't take nearly as long as the six hours we took (not including the finish) to construct. Speaking of finish, we knew our towel stand would stand in the bathroom. Though the towels on it are clean and dry, the environment called for a smooth, impervious finish. A couple coats of urethane works great. 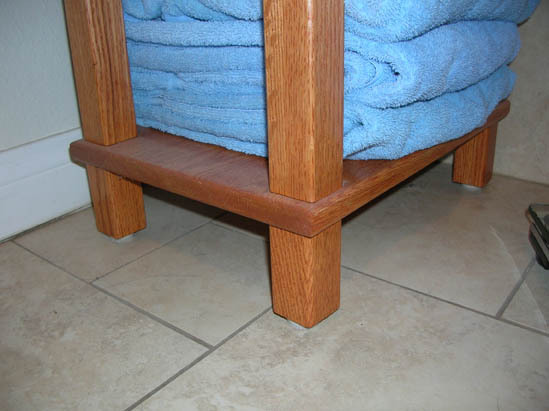 You can add or delete a layer, depending on how tall you want your towel stand. Send us a picture of the one you build.